Parliament must work to unify Australians by respecting different views on marriage, Australian Catholic Bishops Conference president Archbishop Denis Hart said today in the wake of the result of the Australian Marriage Law Postal Survey. 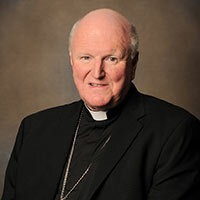 “The Catholic Church, and many others who sought to retain the definition of marriage as it has been understood for centuries, continues to view marriage as a special union between a woman and a man, which allows for the creation and nurture of children,” Archbishop Hart said. “A change in civil law does not change the Catholic understanding of the nature of marriage. “The Catholic Church continues to respect the dignity of LGBTIQ Australians and our ministries will continue to care deeply about the dignity and value of all people we encounter. “Parliamentarians must recognise and respect the concerns of the more than 4.8 million Australians who opposed a change to the definition of marriage by putting in place strong conscience and religious freedom protections. This entry was posted in Press Releases on November 15, 2017 by ACBC Communications.